When we look at the DB Lunchtray we see progression! We see a platform that truly gives you, the rider, unlimited potential for freeriding! Everything about the board is really pretty fantastic! There is a ton of continuous rocker running from tip to tip, it’s like a teeter-totter! However, unlike most boards with rocker, the Lunchtray has a nice deep and precise flushmounting system that slightly lowers the ride height, but more importantly, allows the degree of your trucks to remain unaffected! Not only is it flushmounted, it is flushmounted AND has optional wheelbases so you can really dial this board into your personal style! The DB Lunchtray has some mean concave. Above the wheel wells there are hefty flared up areas of 3D concave that will keep your feet locked in no matter how fast you go or how big you slide. Looking at the Lunchtray you will probably notice that there are kicktails but without riding the board you can’t tell how functional they actually are. Believe us, with all of the rocker that this board has, those kicktails are wild and will pop your board up like crazy! DB Longboards is coming out with some really rad stuff that is going to shape the way for boards of the future. 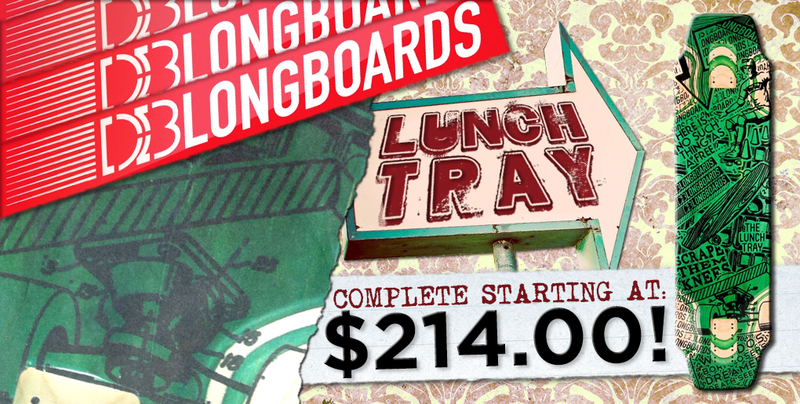 The Lunchtray is just one installment of all their awesome plans to come! If you thought the invention of the wheel was revolutionary… wait til you get your feet on the DB Lunchtray!